Why use figurative language? 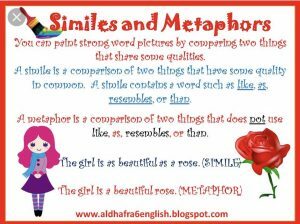 Similes and metaphors create word pictures for the child/student, and the story is more likely to engage the reader. A simile is a figure of speech that makes a direct comparison between two things using “like” or “as”. And, a metaphor makes an implied comparison between two things that does NOT use like or as. When I taught elementary school, I would teach an excellent children’s picture book to introduce similes called Quick as a Cricket by Audrey Wood and Illustrated by Don Wood. The students would write similes about themselves and then illustrate their descriptions. My goal was to encourage the children/students to include similes and metaphors in their writing to make their creative stories more vivid and interesting. 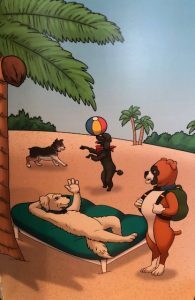 As I wrote TEBOW TAILS ~ Caspar’s Conquest, I wanted to include many similes and metaphors to describe the character’s personality traits and scenery. When I introduce the best friends’ Tebow and Caspar at the beginning of the book, I write “While Tebow has the zest of a busy, Caspar prefers floating like driftwood around a lap pool all day.” I want the child/student to picture Tebow ready to play and run around, although Caspar enjoys resting and relaxing. Since Sage’s curly coat and eyes are as black as coal, he’s a glaring contrast between the white-as-snow beach and lime-green sea grapes. The above text includes two similes; eyes as black as coal to create an image of how dark Sage is and white-as-snow beach to relate to the color of the sand on the beach. As the story evolves, Caspar is bashful but displays his “conquest” of bravery towards Hunter who had treated him poorly. 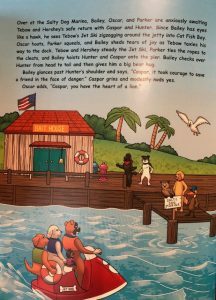 When the pups return to Salty Dog Marina’s dock, Oscar, the wise owl, told Caspar he had the “heart of a lion.” which is a metaphor. The children can picture an image of a very large kind heart. The text and illustrations are more colorful and captivating when similes and metaphors are included in their books. Similes and metaphors assist and inspire children to describe characters and scenery when they read and write.